I shot these pictures of the Pentax K-5 as compared to the Panasonic GH2 to show just how small it is for a DSLR. One of my constant complaints about DSLR's is their ever increasing bulk. Mikes comment yesterday about the K-5 being somewhat "old school" is true in this respect. Pentax have produced a camera that is built like a tank, works really fast and has a true pro spec. in a small package. DSLR's are derived from 35mm film cameras. The whole point of 35mm was to make it smaller, lighter and more portable than larger format cameras. With the "professional" DSLR that seems to have gone out the window. 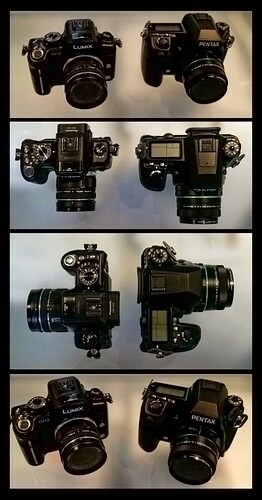 Companies like Nikon used to make small SLR's. This is an F2. Their "Pro" film camera from the 1980's. Their current idea of how a pro DSLR should look is the D3. One of the things that has always mystified me about some Nikon and Canon "Pro" DSLR's is how they include what amounts to a battery grip in the body. To me flexibility in a camera system gives it "professional" status. The ability to mix and match, to customise and put together an outfit that suits my needs is what I want. This everything included, take it or leave it approach isn't. As soon as I opened the box of the K-5 I smiled. To begin with I could lift the camera out with one hand, which was a good start. I still can't get over how comfortable it feels to handle. Because of its weather-sealed construction it isn't that light, but its size and excellent ergonomics make that less noticeable. Pentax also take their "Small but perfectly formed" attitude into their lens range. They offer a series of very small and light primes. Some of which are pancakes and some are included in their limited series. I've used all of these apart from the 15mm and very good they are too. I must admit I've been wanting to write pieces singing the praises of Pentax for some time. Instead I've ended up moaning about the K-7 sensor. Its a real pleasure to be able to talk about how much I appreciate their approach to putting together a camera system, and their design skills, without constantly being frustrated by the sensors they chose. It probably sounds stupid and seriously "fanboyish" but I do feel like I'm back with an old friend. I've been to some pretty special places with Pentax cameras and certainly hope to again. Of all the camera systems I've used, Pentax has provided me with what suits me best in terms of handling. Finally they have come up with the goods in providing digital image quality that doesn't make all of that redundant. Hopefully they will keep going in this direction and get more people to appreciate their virtues. Whether or not they have a go at a mirrorless type system remains to be seen. They have a set of lenses already that would work very well with something like that. The thing with Pentax is that they never rush into anything. If they are planning a m4/3 / Nex type camera then don't hold your breath. Its probably a couple of years before that arrives! !